Boca do Lobo is an exclusive design furniture company that transcends the fusion of traditional and contemporary design. With Sinuous Console you will successfully create a luxurious environment. Sinuous lines draw the elegant character of this console, gathering the styling of the best sellers of Coolors Collection. Sinuous is made for those who love harmonious lines mixed with exquisite detail. Its design is seductive and lures you into a magical and golden world. 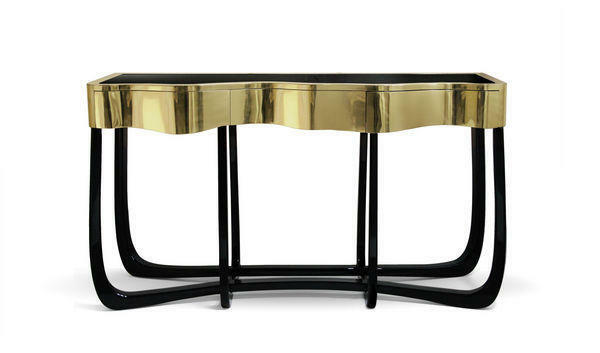 To achieve extravagance, Boca do Lobo's artisans handcrafted the structure in mahogany with a high gloss black lacquer finish and top coated in polished brass plated, bringing up the vivid and bright side of Boca do Lobo. Contains three drawers.